The Development and Alumni Relations held its first Donor Recognition Evening at Ritson Campus, last Friday. The event, a first of many more Donor Recognition events, was held to recognise and express appreciation and gratitude to the donors that contribute financially to the University. 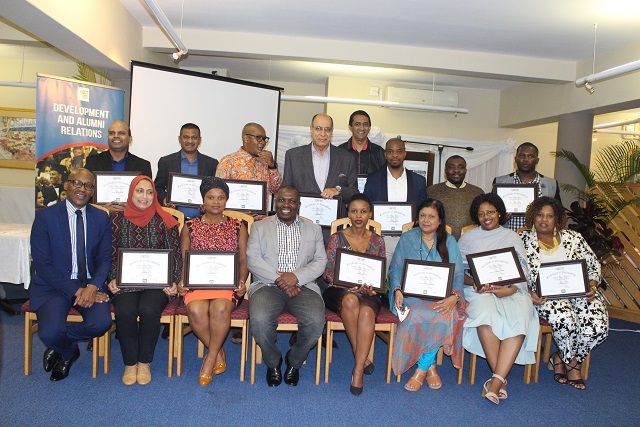 The alumni relations office is the direct link between the Durban University of Technology (DUT) and its graduates and its aim is to cultivate and nurture a lifelong relationship between students and their alma mater. In attendance at the event were members of the DUT council, donors, DUT staff and SRC student representatives, to name but a few. Speaking at the event, Acting Director: Development and Alumni Relations, Zwakele Ngubane said, “One of the primary reasons for the event was to acknowledge those donors with Section A certificates and properly say thank you, because it is important to do so, especially to those donors who are donating to DUT for years, on a regular basis. It’s also good to acknowledge them in a much more significant way and that is what this event is all about; to give donors a token of appreciate in the form of certificates which also forms as symbols of our appreciation,” he said. He also added that in total, there are approximately 109 donors that included corporate companies, trusts, foundations, individual donors and staff donors, that are contributing to date; and the money collected goes straight into the bursary or food fund programmes. Ngubane said that donors are very important components of any University because running a University is extremely expensive and funds generally from tuition fees and government subsidies are never enough. “So universities rely heavily on donor support to fund special projects that enrich student life and academic experiences of our children. As DUT, we do have a long way to go in terms of growing our donor numbers from corporate to our individuals donors and we hope that those donors who are contributing will continue to do so,” he added. Vice-chancellor and principal, Professor Thandwa Mthembu, welcomed the DUT council members, donors , staff and SRC representatives, also expressing his gratitude to the donors on the evening and thanked each and every person for their vital contributions to the University. “Many decades ago, the government used to provide lots of funding, at least 80%, but the funding has dwindled over the years. We now sit at 60%, part of problem is because the increase that is expected from students as government subsidy. There was a report published in January this year. It’s a report on a survey of 11 universities on philanthropic funding,. First, it came out with the statistics suggesting a lot of work needed to be done to inculcate a culture of philanthropy in this country, especially towards universities. Only 8% of philanthropic funding is for universities of this country, which comes from individual donors,” he stressed. He added that compared to the USA and UK, where funding received is 43% and 53 % respectively, there is a need to be concerned in South Africa. Prof Mthembu said that its not so much DUT that is in trouble, it has to do with the culture of philanthropy in this country and that we (DUT) could not wait until the culture of philanthropy has been improved. “We got to start somewhere and need to start here at DUT. If you look at the numbers who donated in 2013, it was only nine. Out of 11 universities, we at DUT are last out of the 11 with the number of donors that had contributed. Here in South Africa only, we have a lot to do to increase the percentage at our environment at DUT, as much as many other universities. We really hope to cement our partnership with our donors, do more to attract our alumnus, foundations, trusts and individual donors. Those donors who donate, we really appreciate it, and we hope each and every alumnus and staff contribute, to build our University for generations to come,” he said. Also, thanking donors for their contributions was the Chairman of the DUT council, Wiseman Madinane, who also reiterated that the culture of philanthropy in South Africa is very weak. “We need to ensure all who go through the University should contribute to philanthropic funding. This highlights the universities need to increase ways of funding,” he said. Madinane also thanked the donors for their generosity to DUT, adding that donors proved to be the most strategic partners at DUT,” he said. The donors who received certificates included external donors-which are companies, trusts and foundations. Ngubane, also spoke of the missing middle campaign and reiterated donors to continue giving and if anyone was keen to donate, they could go to http://www.dutalumni.com/ways-to-give, to find out how to donate.